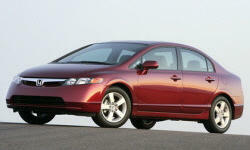 Honda Civic Audio & Nav Systems Pros and Cons | Page 1 of 1 | Why Not This Car? Stereo quit after six years. Audio sounded ok, figured id just put my own beat in the car. Weak sound system even in the top-level EX sedan with no upgrade options. Very weak sound system even in the top of the line EX. Harsh and bright and no base. No navigation system is offered, audio system could be a little clearer. The best stock audio system at that price point, with plenty of features....MP3 and WMA playback, Auxiliary port for mp3 player. Very impressed as to the Nav system. Although I have a portable Nav it does not do all the things that this new system does. Nice, but causes a lot of rattles in the rear deck when turned loud.